Blog | Possession? Drug trafficking? Black market? Blog - Possession? Drug trafficking? Black market? Possession? Drug trafficking? Black market? Do these sound like appropriate terms to describe patients taking physician recommended/prescribed medication? Well these are exactly the terms used by law enforcement for medical marijuana patients who purchase their medicine illegally, or those who travel to states without medical marijuana laws in place and/or travel to those states with laws, but without reciprocity. 1. What are people in need of medical cannabis to do when the states they live in don't have medical marijuana laws in place? 2. What are patients to do when travelling to states without medical marijuana laws, or to states with laws but not reciprocity? Forty percent of the United States do not have medical marijuana laws in place. That means for those patients who would benefit from medical cannabis living in these states, there is no legal option to obtain their medicine. The only way to purchase their medicine is through illegal means, or rather, "on the Black Market". If obtained this way, instantly this patient is a criminal, able to be prosecuted to the fullest extent of the law, simply for buying medicine. Does this seem right or fair, especially when conversely, 60% of the United States do have medical marijuana laws in place?! Hardly! It's time the federal government listen to the voice of the people and enact medical marijuana laws nationally. What about patients who travel to states without medical marijuana laws and/or travel to those states with laws but without provisions for reciprocity? Should a medical marijuana patient travel to states without medical marijuana laws in place? This isn't such an easy question to answer. By answering "no", medical marijuana patients become second class citizens, having restricted freedom to travel about the country while still being able to medicate. By answering "yes", medical marijuana patients are faced with the dilemma of whether to attempt travel with their medicine, placing themselves at risk legally, or to stop their treatment for the duration of their travels, placing themselves at risk medically. Clearly this is a situation filled with difficult choices, that can only be answered by individual patients who are faced with them, and yet the solution is simple. Enact medical marijuana laws nationally! Then there's travel to states with medical marijuana laws, but no provisions for reciprocity. What does reciprocity even mean? For those states with medical marijuana laws in place, which also have provisions for reciprocity, patients can typically travel to and from those states with their medicine, or be able to obtain their medicine from a dispensary while visiting those states, all without fear or criminal prosecution. It would seem logical, that for those states with medical marijuana laws in place, reciprocity would be automatic and natural extension of those laws, but it’s not. 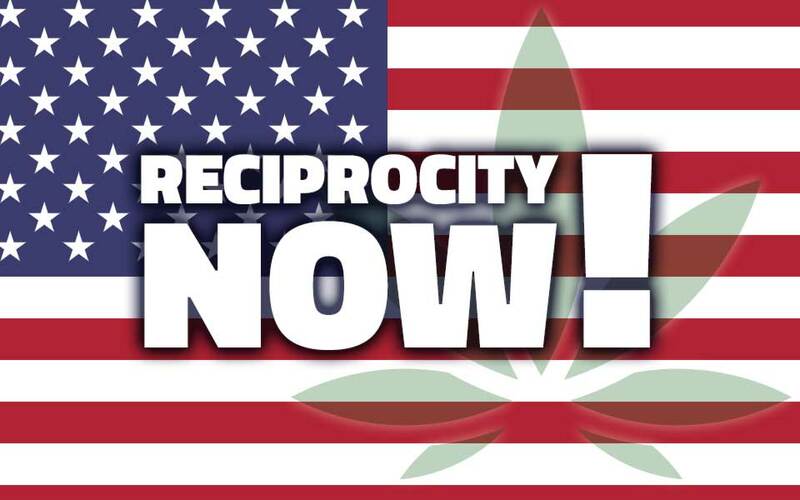 Only a handful of states with medical marijuana laws have provisions for reciprocity. It seems clear that reciprocity between states with medical marijuana laws is needed to avoid the criminalization of patients who use medicinal cannabis. So how do we get there? Federal rescheduling of cannabis seems to be at the heart of any discussion about reciprocity and treating cannabis in the same way as any other medication, and while this would resolve most of the issues, it has been addressed in previous blogs and won’t be the focus here. What about a National Medical Marijuana Card? A practical and effective solution, yes, but for this to happen, states would have to have uniform laws, or the federal government would have to have one law. How about standardizing strains and dosages of medical cannabis for the conditions being treated? This strategy would certainly lend itself to a higher level of perception and acceptance of marijuana as medicine and address much of the confusion that especially new medical cannabis patients have when medicating. While things are trending in the right direction, medical marijuana has a long way to go to be accepted, viewed, and treated as other medicines. Federal rescheduling and interstate reciprocity will bolster this initiative. Sooner than later this issue needs to be responsibly resolved. Patients who have been recommended by their physicians to use cannabis should not be criminalized and fear legal prosecution for medicating. Unfortunately, until we see changes in the laws on the state and federal level, this is exactly the case.